The explosion of bars that specialize in complicated, labor-intensive, ingredient-driven cocktails has truly been a wondrous thing for those of us who enjoy drinking. It has also made the act of actually ordering drinks in bars more complicated than it once was. (And not just because it means you are now expected to know the proper pronunciation of Cynar.) 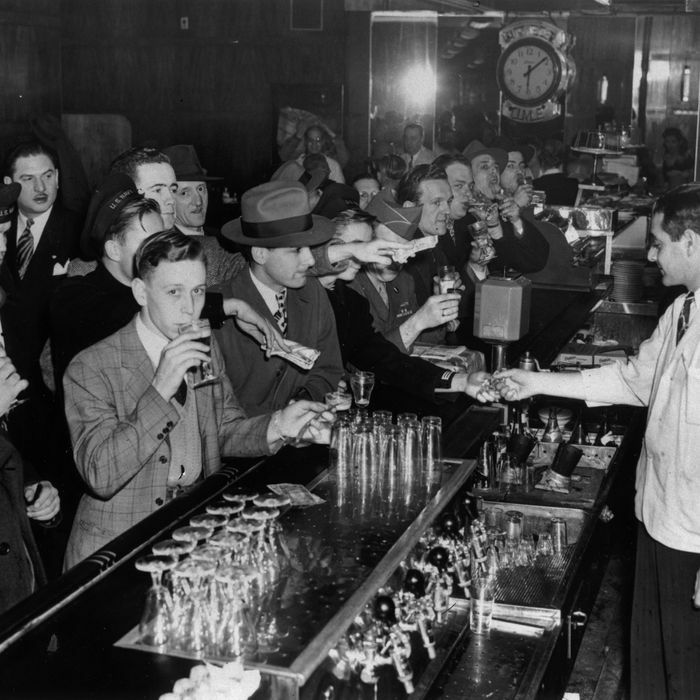 There are a zillion different kinds of bars that specialize in a zillion different ways to drink — you’ve got your pre-Prohibition places, your tiki places, your high-end science-y places, your ironic pseudo-dive bars, your non-ironic actual-dive bars, your hotel bars, your bar-bars that have been around forever, etc. And while you can always order something from a drink menu, there comes a time in every drinker’s life when he or she needs to place a drink order unchaperoned. Here’s how to do it correctly. Which is precisely the question everyone should ask themselves before figuring out what they want to drink. Just as a martini order won’t fly in Ireland, Stoli-and-soda isn’t your best bet at a serious-minded cocktail joint. You wouldn’t go to Paris just to eat a Big Mac, right? Similarly, don’t just go for some knee-jerk drink order. Survey the landscape and make a quick plan. Remember this: Even though your bartender is there to accommodate you, you will go far in life if you also accommodate your bartender. But note: We aren’t talking about beer and wine here — almost all bars offer those to at least some degree, and they tend to stock products commensurate in quality with the bar’s. We’re talking about mixed drinks, since that category can vary so wildly. To help you navigate, the team here at Sloshed HQ has come up with some guidelines to fit any bar: These are the five circles of appropriate drinking. (Think of it like Google Plus, but with the possibility of liver damage.) When considering your drink order, you need to think about the bar’s vibe; evaluate the available ingredients on the back bar; assess how common your drink order is as well as how difficult the drink is to actually make (for example, do not order a Ramos Gin Fizz just anywhere). Once you’ve considered these variables, you can pick the drink you want from the prescribed list of acceptable cocktails. Drinks at this level are like the lingua franca of most bars in this country. There is little confusion about what you are ordering and no worry that the bar won’t carry the necessary ingredients. Where to Order: Pubs, real dive bars, any place that advertises its season-long NFL Sunday Ticket subscription or lights up its vodka bottles. What to Order: This is the most barren of all drink circles, and you’ll want to get no more ambitious than various combos of booze and ice, or drinks that require one spirit and one mixer: gin and tonic, Jack ‘n’ Coke, Scotch and soda — you get the idea. These are the drinks that everyone should know how to make. If you get a blank stare when you order from this circle, that’s the bartender’s fault, not yours. And if that does happen, you can also explain the drink’s recipe knowing the bar will almost certainly stock the necessary ingredients. Shoot low here: You may think everyone should know how to make a Sidecar, but that’s just a sign that you are spoiled. Avoid citrus drinks or anything that would require fresh ingredients. Where to Order: Ironic dive bars and places that stock one bottle of bitters and no more than three kinds of vodka. Also, there might be a TV playing sports, but that sport is baseball. What to Order: Martinis, Manhattans, and old-fashioneds are good go-tos (provided you’re confident the bar doesn’t put stuff like orange wedges in any of the those drinks), but be wary of any drink order that requires precision. Jackson Cannon actually suggests going with a Negroni here, and his reasoning is solid: The drink is simple and the proportions are as easy as they come. Campari, gin, and sweet vermouth in equal measure. And it’s served on the rocks, which means it’s supposed to be a little watered-down. Here we ascend from the material to the sympathetic. Drinks at this level are composed of simple, standard ingredients, but can be unpleasant if made poorly. Where to Order: Places that stock at least a couple of bottles of rye, simple syrup, more than one type of bitters, and give their house cocktails names like “Dante’s Inferno” or “Mama’s Little Helper” or whatever. In other words, places that are trying to be Death & Co. but aren’t quite operating at that high level. What to Order: Any drinks from the foolproof classics will be made far better here, but you can also get into more interesting cocktail territory. Sazeracs, Aviations, and French 75s are all good. Just stay away from anything that requires more than basic juices and standard ingredients. Now we’re getting into it. These are the kinds of drinks that tempt people to use the word “mixologist” when talking about the bartenders. Where to Order: Places that purchase specialized equipment expressly made for concocting drinks. High-power blenders, sieves, those little apothecary bottles that hold things like homemade syrups, bitters, or homeopathic medicine. What to Order: Go bold with your order. If a bartender calls himself a mixologist, you might as well make him work for the title. You can feel safe ordering drinks that require egg whites, multiple types of the same kind of spirit, or fire, but probably not all three in tandem. Here is also where you’ll find the collection of nouveau tiki bars that have opened in the last couple of years. If you end up in one of these places — and you will know it when you do — order a Mai Tai or Piña Colada; it will change your opinion of how good those drinks can be. This is the upper echelon. Here, you can order pretty much anything your nerdy cocktail brain can imagine. In fact, you don’t even have to have a specific drink order in mind: Just list off the kind of stuff you like — “I’ve been doing a lot with applejack lately, but was in the mood for something that is basically a crusta.” — and you’ll have it. Where to Order: Is the bar called PDT or Mr. Lew’s Win-Win Bar or the Hawthorne or Clio? If you know those bars, I trust your judgement. What to Order: This is graduate-level drinking, and as is the case in actual graduate school, vaguely free-forming your thoughts is the best option. That said, a few otherwise unavailable classic drinks show up in this circle, too: the Vieux Carre, Widow’s Kiss, and any kind of Corpse Reviver should be reserved for this kind of drinking. As always, these are guidelines, not hard-and-fast rules. If you find yourself in a sports bar, but the bartender has a handlebar mustache and you spy a copy of Dr. Cocktail’s Vintage Spirits and Forgotten Cocktails tucked behind the bar, by all means adjust your order accordingly. And if you’re a big tipper, order whatever the hell you want because money immediately renders every drink order less lousy. Matthew Latkiewicz writes about drinking and other subjects at You Will Not Believe. His work has appeared in McSweeney’s, Wired, Time.com, Boing Boing, and Gastronomica. Follow him on Twitter.